New Delhi, 08 October 2018: At its second convocation held recently, Apeejay Stya University conferred honorary degrees to Dr Rajiv Kumar, Vice Chairman, NITI Aayog and Mr Kanshi Nath Memani, Former Chairman, Ernst & Young, India. Dr Rajiv Kumar was honoured for his contribution in the field of Economics &Governance and Mr Memani for his contribution in the field of Corporate Governance & Finance. The Convocation was held at the Dwarka, New Delhi Campus of Apeejay School of Management (ASM) and Apeejay Institute of Mass Communication (AIMC). Dr Rajiv Kumar complimented all the graduates and especially the Apeejay Education Society for completing 50 glorious years. “The vision of AES and ASU Founder, Dr Stya Paul, has been so wonderfully nurtured with great care by his daughter, Mrs Sushma Paul Berlia,” he said. He recommended graduating students to be ‘job creators’ rather than only ‘job seekers’. Speaking on the momentous occasion, Mrs Sushma Paul Berlia, Co-Founder and Chancellor, Apeejay Stya University, said, “ASU is in the pioneering forefront of putting into place an education in the country, which while imparting knowledge in tune with the needs of the industry and economy, engenders in students thinking &analytical skills to lead to a holistic growth in personality as a human being.” To the graduating students, she said, “Have the inner strength to believe that anything is possible if you set your mind to it”. Dr Rajiv Kumar is an eminent economist. He is also the Founding Director of the ‘Pahle India’ Foundation, a non-profit research organisation that specialises in policy-oriented research and analysis. He has written several books on India’s economy and national security.Dr Rajiv Kumar graced the Convocation Ceremony as the Chief Guest. Mr Kashi Nath Memani is a renowned Charted Accountant professional. He has also served on the External Audit Committee (EAC) of the International Monetary Fund and was appointed the Chairman of EAC for the year 1999-2000, being the first Indian so far appointed in the committee. He is also the President of Him Jyoti School Dehradun, which provides free education to poor girls. 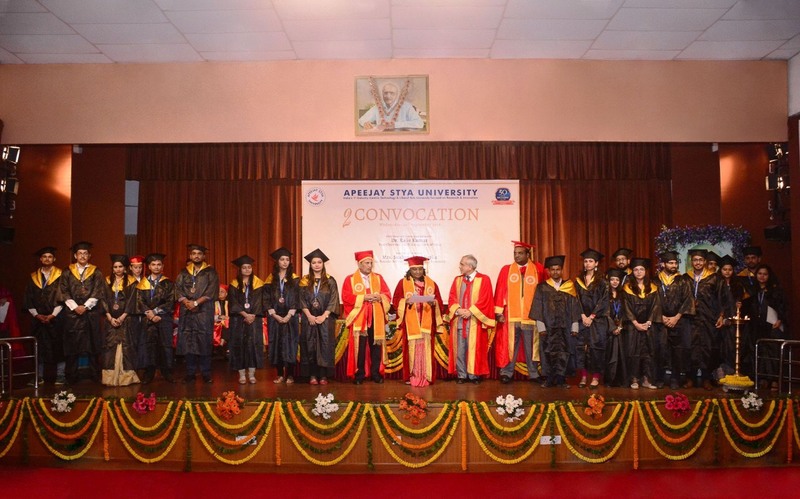 In the 2nd Convocation Ceremony of Apeejay Stya University (ASU), a total of 328 students received their Convocation Degrees for Graduation, Post-Graduation, Integrated Programme and PG Diploma in various disciplines. Further, 11 research scholars were conferred with Doctorates Degrees for the successful completion of their Ph.Ds. Toppers of various schools of ASU were also given Gold, Silver and Bronze medals for their academic performances. Son Of Manjeet Singh: Kapil Sharma and Gurpreet Ghuggi Promote their upcoming movie In Delhi!